A new camera enforcement van is helping a local council in south Wales to tackle illegally parked vehicles at schools in the area. Neath Port Talbot Council is deploying the van as part of a county-wide school gate parking campaign, carried out in partnership with South Wales Police and Mid and West Wales Fire & Rescue Service. The van, which photographs illegally parked vehicles, generates a fixed penalty notice that is sent directly to vehicle keepers’ registered address. It is equipped with two roof-mounted Automatic Number Plate Recognition (ANPR) cameras and two colour cameras to capture video evidence. 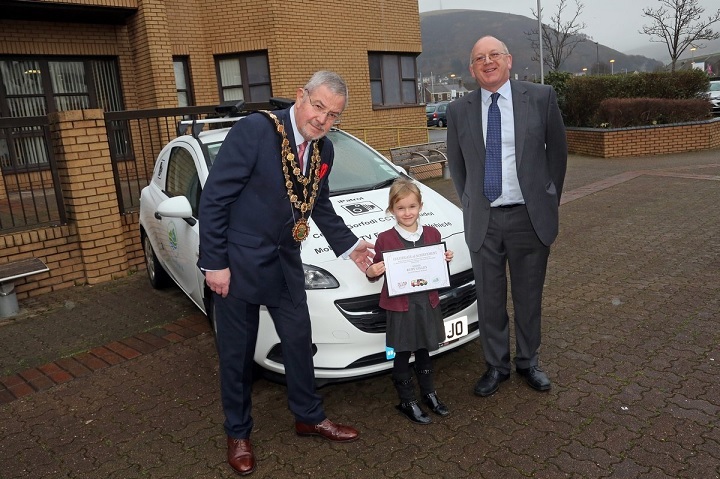 A competition was held to name the new vehicle, with the winning entry – ‘iPatrol’ – submitted by Gnoll Primary School pupil Ruby Gilley (pictured). Banners are also being displayed outside schools to raise awareness of the dangers of illegal parking, while pupils are being educated and encouraged by the council’s road safety team to positively influence parents and others who drive them to school. However, Neath Port Talbot Council says enforcement ‘appears to be the most effective way to tackle this growing issue’. Cllr Rob Jones, leader of Neath Port Talbot Council, said: “Indiscriminate and dangerous parking around Neath Port Talbot will no longer be tolerated. “The mobile enforcement vehicle seeks to challenge drivers who choose to park on school ‘keep clear’ markings, within clearly defined bus stops and on pedestrian crossings – with no thought for the safety of others. That would be fine Guzzi (and Charles), provided drivers were uniformly competent enough to be aware of the hidden dangers of parked cars and slow down accordingly…but they don’t all do that as we know, hence the ‘free-traffic calming’ notion is a bit of a false hope. Also, if parked cars restrict normal two-way flow and drivers expect to have to have to wait until the way is clear, there is a tendency for them to actually speed up and pass the parked cars faster than they would have otherwise done, simply to get to the other end before another vehicle approaches. Parked cars do act as free traffic calming and removing them can cause traffic speeds to increase as Charles has said. However too many inappropriately parked cars especially by schools can restrict visibility between pedestrians and drivers. It does not have to be all or nothing, there are solutions available between these two extremes. Because most schools had these markings applied as a matter of course. When they were originally conceived, it was expected that most people would use common sense and not park on them, without the need for a covering TRO. In the exceptional case where someone did park there, the old Unnecessary Obstruction law would be used. However, with the increase of the “I know my rights” brigade, fuelled by scumbag lawyers and legal aid, unnecessary obstruction is nowadays a little more difficult to prove. You realistically need to get out a tape measure and take photos etc. to convince easily-duped magistrates. Hence, a specific offence, covered by an easily-enforceable TRO, is required. I’m not sure that parked cars are a safety problem, they act as free traffic-calming measures. I know that when no-parking and 30 mph limits were introduced on a 40mph road near where I lived, it was transformed from a road of slow-moving traffic squeezing between the parked cars on each side, that could be safely crossed anywhere along its length, to a continuous stream of 40+ mph traffic travelling in both directions – thus rendering it impossible to cross. The solution chosen by the local authority was not to revert to what worked before, but to install a toucan crossing at one end of the road, meaning pedestrians having to file down one side of the road to the crossing, then back along the other side to where they wanted to be. Doesn’t anyone ever think these things through first? Hi Bob, I specifically said “legally valid ‘School Keep Clear’ zig-zag markings”. For ref, all school zig-zag markings in our county are covered by a TRO with signage as required – to eliminate that very problem. ‘unreasonable obstruction of the highway’ could still apply Bob as the driver has no entitlement to stop on the zig zags – sign or no sign – although I agree it’s better if there’s a TRO in place. How do some zig zag markings come to be applied, if there’s no TRO anyway? That does not appear to be so Pat. May I repeat myself. I know that I often do. There is no offence committed by anyone stopping or parking outside a school where there are zig zag lines and where there is no upright and lawful yellow sign displaying the stopping prohibition thus making the lines a legally ‘prohibited’ area. If a school doesn’t have such a lawful sign they can get one and then and only then can the zig zags be enforced. If officers of the council or police officers have reported drivers for stopping where there are no such ‘prohibiting signs displayed’ than they have been wrong in doing so and such fines imposed would have been obtained wrongly also. It comes under the R.T.R.Act. secs 5 & 8. This will help, and I wish every county had at least one. There is one thing in common with a camera car and a policeman, they can both enforce legally valid ‘School Keep Clear’ zig-zag markings when they are present. But with dozens of schools to cover, many drivers will still take a chance that the camera car/policeman will not be at their school when they knowingly choose to park illegally for their personal convenience. I know of parents who have received several tickets for parking illegally outside their schools. Perhaps those drivers have more money than sense? As I have said previously parents believe that the lines are there primarily for the purpose of them stopping and unloading or picking up their kids. If there are no legally placed yellow no waiting or stopping signs then no offence is committed. It’s quite possible that some drivers know that fact and so disregard safety issues and the danger that they place others in. Once the legal notices are placed then prosecutions can begin and I am sure that if one is fined say £60 a time that will stop a lot if not all drivers from stopping.